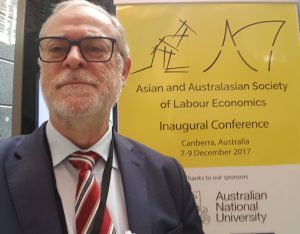 The Asian and Australasian Society of Labour Economics (AASLE) was founded to promote research and cooperation in Labour and Applied Economics across Asia and Australasia. The inaugural conference of the AASLE brought together over 400 researchers and over 120 papers from around the world and was hosted by the Australian National University Research School of Economics in Canberra, Australia, from 7-9 December 2017. The event has been impressive and was a huge success. 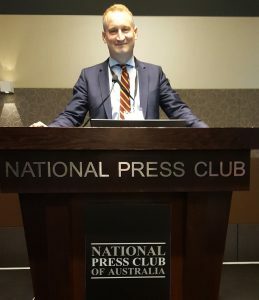 The event was organized by Christian Dustmann, University College London; Bob Gregory, Australian National University and GLO; Xin Meng, Australian National University and GLO; John Tang, Australian National University; Matthew Gray, Australian National University. John Haisken-DeNew chairing the GLO session at the AASLE meeting in Canberra. GLO President Klaus F. Zimmermann was presenting a paper in the GLO session and another one in a general parallel session.